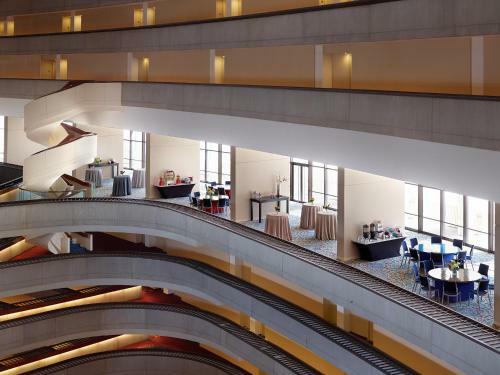 With a spa an outdoor heated pool trendy dining options flat-panel TVs and the utmost in southern charm our guests find solace at the downtown Atlanta's majestic non-smoking Marriott Atlanta Marquis. 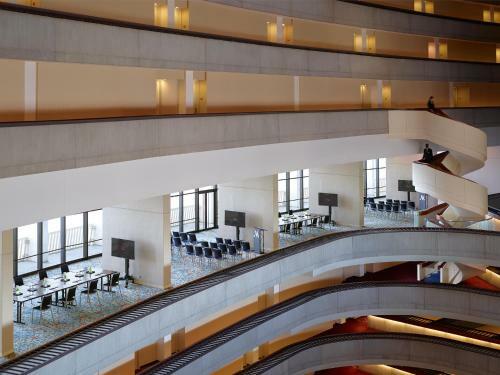 The stately 50-story Marriott Atlanta Marquis features 1569 elegantly appointed rooms with floor-to-ceiling views of A-Town premium bedding flat-panel TVs with premium channels pay movies and plug-in panel Wi-Fi (fee) desks coffee makers and granite countertops in the bathrooms. Relax and rejuvenate with a massage in the on-site spa a sunny dip in the outdoor heated pool or a workout in the fitness center. Dining options include a popular restaurant and bar open for breakfast lunch and dinner a spacious high-energy sports bar (lunch and dinner) a lounge featuring a lofty 50-foot color-changing sail and cool cocktails and an on-site Starbucks. 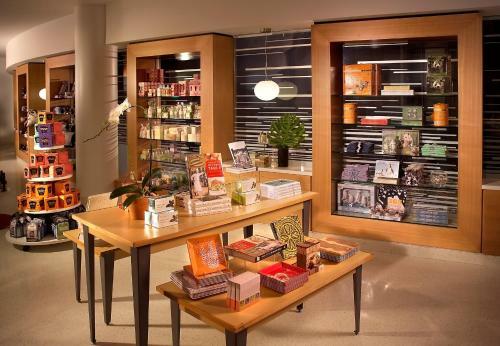 Business center services are available as well as a concierge and there's a shop on-site where you can purchase cool gifts and quick snacks. Downtown Atlanta's Marriott Atlanta Marquis is 11 miles north and within a 20-minute MARTA rail ride of the Hartsfield-Jackson Atlanta International Airport. Park your wheels with the valet (for an additional fee) and explore downtown's exciting city sites. The hotel is two blocks from the Peachtree Center Mall and AmericasMart four streets from the Centennial Olympic Park and Georgia Aquarium and less than a mile from CNN Studios. 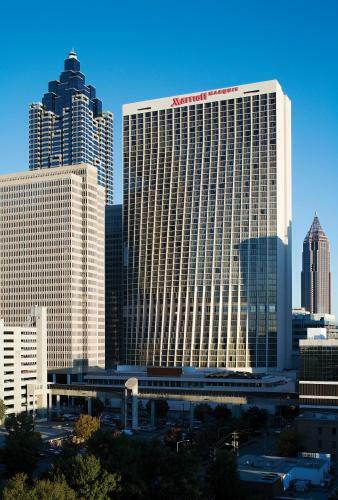 Add Atlanta Marriott Marquis to your free online travel itinerary.